Online Gambling is huge these days but often you can find yourself blocked, restricted from sites, exposing your privacy and a host of other issues. This is where a VPN comes in to play. But which VPN should you choose for Online Gambling? Finding a reliable VPN is critical for Online Gambling. Select the wrong one and it could drop mid-way through your session. The worst case scenario is your real IP Address is exposed resulting in your account being banned. However, with a reliable and tested VPN service, this won’t be an issue. In this guide we’re going to show you the Top 5 Choices of VPN when it comes to Online Gambling and below that explore a few of the details you need to be aware of when Online Gambling with a VPN. IPVanish is our number 1 choice for Online Gambling. Connections are available in over 60 different countries which will allow you to access the most popular worldwide gambling sites regardless of where you’re physically located. With a guaranteed no-log policy it means what gambling and other sites you access remains private so only you know what you’re doing while connected to the internet. You’re also able to specify individual cities in many countries allowing you to circumvent many online gambling blocks. We found IPVanish to offer some of the fastest speeds allowing you to gamble without interruption and their apps for both mobile devices and computers make connection extremely easy, especially if you’re a VPN beginner. If you need access to the widest possible range of countries then ExpressVPN has your back. There are VPN servers in more than 94 countries and 148 different cities. They also have a selection of virtual servers which allow you to appear in a certain country but give you local access speeds meaning you won’t be plagued by lagging but can still circumvent geo-restrictions. There’s a massive 30-day money back guarantee on the service which will let you test it for an entire month on your favourite gambling sites. If you find it isn’t for you then just get a refund. If your gambling habits are a bit more serious, especially if you’re into online Poker then you might want to sign-up to a VPN provider that is off-shore. NordVPN is registered in Panama and they have a no-log policy which means your usage remains private. One of the best features of their service is their double-hop VPN servers that pass your data through two different countries. If you want to be extra secure when gambling then you’ll definitely want to make use of these. They’re also one of the cheapest providers if you’re prepared to commit for 2 years. At just US $3.29 per month, it’s hard to find a better deal. It’s important to remember you’ll be locked in for 2 years to get that price. Even if you don’t want to commit they do offer some competitive pricing and with a 30-day money back guarantee it really isn’t that risky to commit for so long because you’ll know within the first month if their service is for you or not. CyberGhost VPN has expanded massively in the past year and over doubled their VPN server location count to 52 countries. This makes them much more useful for online gambling because there is a whole host of countries you can connect to including the major gambling hubs. We especially liked their service because the ease of use of their apps which guide you to selecting the correct server for your needs. The service allows you to use it on up to 5 devices at the same time so if you’ve got more members of your family who want to use a VPN for online gambling or any other purpose then they’ve got you covered. PrivateInternetAccess otherwise known as PIA is our budget option. They’ve got over 1 million subscribers and it isn’t without good reason. They offer a good service at an affordable price. If cost is your main consideration then you’ll want to sign up for PIA. They don’t quite have the VPN country location numbers that the other providers do but there are still a good 25 locations covered. You’ll need to see if these are suitable for your needs first but if they are then you’ll get yourself a bargain price. Their service also doesn’t offer quite as fast speeds as some of the others, but again, if price is key you get a good all round service for a low price. Online gambling is huge across the world and using a VPN with it can bring in some advantages and disadvantages. You should consider if a VPN is necessary for your needs. For example, if you’re in a country where online gambling is restricted or you need to access another countries gambling site then a VPN is essential. It’s also essential if you want to protect your online privacy so no one knows you’re online gambling but yourself. However, a VPN can bring in some associated risks, especially if you’re using it to avoid geo-restrictions to play on sites that you’re not intended to play on. The benefits of using a VPN for online gambling are vast. Too many benefits to cover in the short space of this article. However, as a quick round-up, one of the major benefits is the ability to access gambling sites not available in your country. This can be when you’re outside of your home country, or if there’s a specific site that isn’t available in your own country, but is available in another. A VPN can also help you protect your privacy while online gambling. 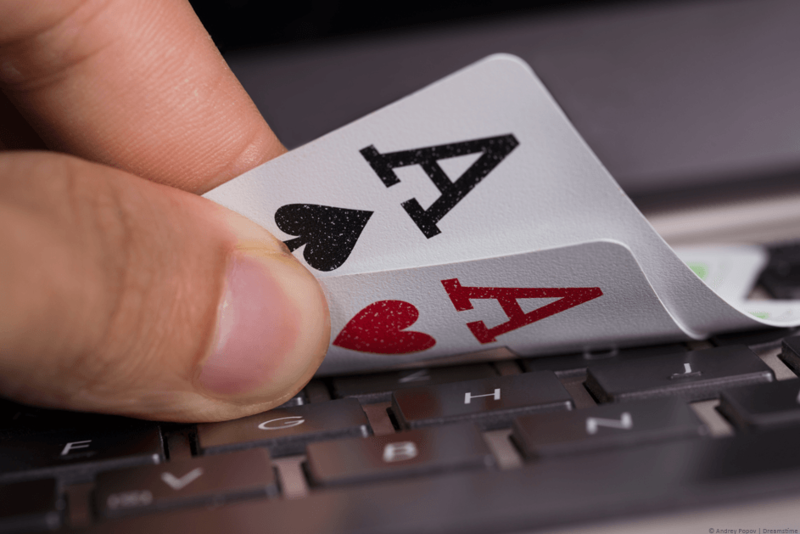 Online gambling can often be frowned upon or blocked on certain networks. A VPN will allow you to bypass such blocks without anyone knowing. If you’re using a VPN to access websites that are not intended for your country then you risk breaking the terms and conditions of that site. In a best-case scenario, a site may let you withdraw any winnings but close your account afterwards leaving you unable to play at that site in future. At worst case, a gambling site might close your account instantly and make you forfeit any winnings. If this is a small amount it won’t be too much of an issue but if you’re a high stakes Poker player for example then you could stand to lose a lot. The good news is, getting a VPN for online gambling is simple. It’s important you select a good VPN service like one of the five we listed above. If you pick a bad service then it’ll seriously hinder your online gambling experience. Follow the instructions below to get a VPN and set one up. Choose one of the five providers listed above and click on the button to visit their site. Sign up for their service and select a subscription length – Remember, it’s cheaper to sign up for a longer period. Download their app for your device either from the Apps section of their website or your usual app store. Install the app, run it and login when required to. You should now select a country suitable for your needs and press Connect. If you’re after accessing an online gambling site from a specific country then connect to that country. If however you just want to protect your privacy or access a website blocked on your network then connect to your current country. VPN services are available for all major devices. The five we listed above work on both mobile devices and regular computers such as desktops and laptops. All five recommend providers listed above have apps for both Android and iOS tablets and phones. They also have software for Windows and Mac desktop and laptop computers. This means you’re able to use a VPN for online gambling on almost any device. These days internet connections are more restricted and monitored than ever before. To keep your privacy intact when you online gamble or do anything else a VPN is an essential tool. On top of that a VPN will allow you to access websites not available in your region. Or from your home country if you’re travelling abroad. There are a few small risks associated which we summed up above but the benefits far outweigh the negatives. All you need to do is select one of the five VPN providers listed above and enjoy online gambling using a VPN. Whatever the benefits of using a VPN for online gambling there are a few important reminders. As always you should only gamble or bet money you can afford to or are happy to lose. If you find you are spending above your means or spending too much time online gambling where it is affecting your regular life then you should seek help. In the United States, you can contact the National Council on Problem Gambling and in the UK GamCare. For other countries, you should search Google for “Gambling addiction + your country name”. It’s also extremely important to consider local laws. Online gambling is illegal in some countries and using a VPN is no excuse for breaking the law. Before you online gamble with or without a VPN consider the laws of the country you’re currently in.